Okay…so…WAY BACK in 2014…some of you may have seen this post for like…4 seconds…when I “SCHEDULED” it for “January 27th” and couldn’t figure out why it published. Uhm. Because I “Scheduled” it for “January 27th, 2014”. Ohh year change. 🙂 I hope everyone had wonderful holidays and is having an amazing start to the new year…Is January really almost over?! There are so many things wrong with this recipe I am about to share with you. 1 – It almost didn’t even happen the night I made it. I decided I wanted lentil soup. I started throwing things in the instant pot. I went to put in the lentils. I only had about 1/4 a cup. WampWamp. 3 – I took pictures of it to share with you guys…but now (about two months later) can’t find my notes as to how I made it. I’m pretty sure I remember. Eeek. I hope so. 4 – Uh. I edited this pictures while I was flying. I think they may have looked better in the lighting of a plane. Can you please read this blog post while flying and let me know?! 5 – Trust me. It’s good. Forgiving. And … just give it a shot. You wanna make it? Let’s go! Click the "Saute" button and wait until warm. Add the onion and garlic. Saute until beginning to brown. If it starts to stick, add a splash of vegetable broth. Once beginning to brown, click the "cancel" button to stop the saute. Add the red curry paste, ginger powder and red pepper flakes and stir well. 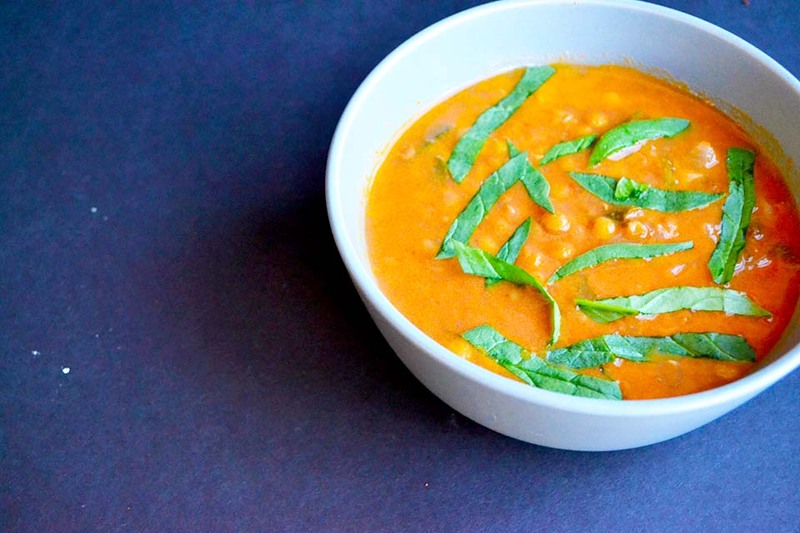 Add the coconut milk, diced tomatoes, vegetable broth and lentils. Stir well again. Close the lid. Click the "Manual" button and reduce the time to 6 minutes. Let the pressure release naturally. After it has released, open the lid and stir in the chopped spinach. In a large soup pot, saute the onion and garlic. Add the remaining ingredients, except for the spinach. Stir well. Bring to a boil. Cover, and cook until lentils are tender. Open lid and stir in spinach. This soup freezes well. Let cool in the fridge overnight before freezing. Freeze in individual serving containers. Thanks for this recipe, Chelsea! I just tried this as my first Instant Pot recipe and it turned out well. After the 6 minutes were up and into 3 minutes of the natural release it dawned on me to do a quick release–a good idea as the soup was starting to stick to the bottom of the insert. I waited to add the coconut milk after the quick release and used baby kale instead of spinach. The next time I make this I’ll add fresh ginger and will try to find red curry paste (I had to use a dry curry mix). Thanks for the recipe! 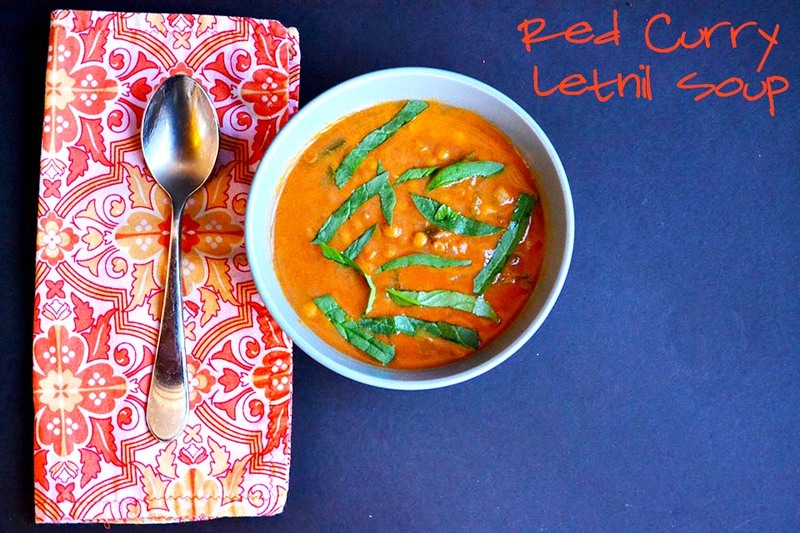 Did you use red or green lentils? Do you think rice eould work the same? YAYAY! I am SO GLAD that you enjoyed it!!!! Thank you for letting me know! Question: Do you need to pre-soak the lentils? I just made this and it is so good! I was out of broth so I just used water but added about a teaspoon of salt to compensate. I also used half a chopped jalapeño and fresh ginger paste with the onion saute, and added some chopped baby bella mushrooms and mini bell peppers at the end of cooking since I had to use those up. (The residual heat cooked them just enough once I closed the lid back for a few minutes.) We had it over rice but I think it would be great with noodles too! Ah! Your substitutions sound GREAT! I am so glad you liked it! Hi Chelsea, I was so excited to find this recipe when looking for Instant Pot recipes, since it sounded delicious! 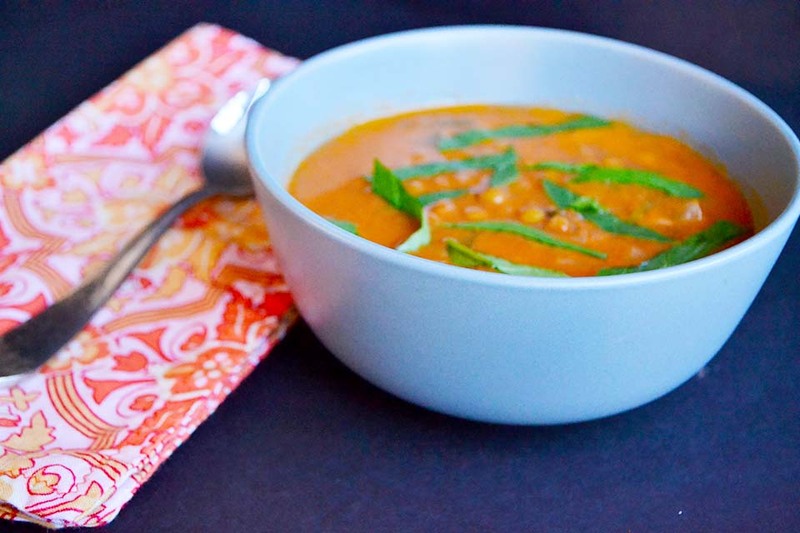 I wasn’t disappointed last night when I made it — this soup is awesome! My veggie stock has salt (I didn’t notice beforehand) so I ended up cooking the lentils for an additional 3 mins after the initial cooking. My husband and I digested the dinner very well — had it over brown rice — and the scent and flavor were sublime. Thank you for sharing this recipe & keep up the great work! This is the only thing I’ve made in the Instant Pot that gave me a problem. I was busy doing other things and did not check to see if the pot came to pressure. It cooked for 7 mins and I knew something was off because I could open the lid way before I should have been able to. There was a little bit of scorched soup but the lentils and everything else cooked. I blended it and it is still delicious. Hmm that’s odd!! It sounds like it didn’t seal properly. Perhaps check your seal? It may have also overheated a bit – it should throw an overheat error instead of coming to pressure if this is the case. Let me know if you have other questions!